I’m pleased to announce that my entry in Spoonflower’s “Grandma’s Kitchen” tea towel design challenge made the top 10 this week! This was such a fun theme to work on — starting with going through recipe cards with my mom to pick out a few family favorites. 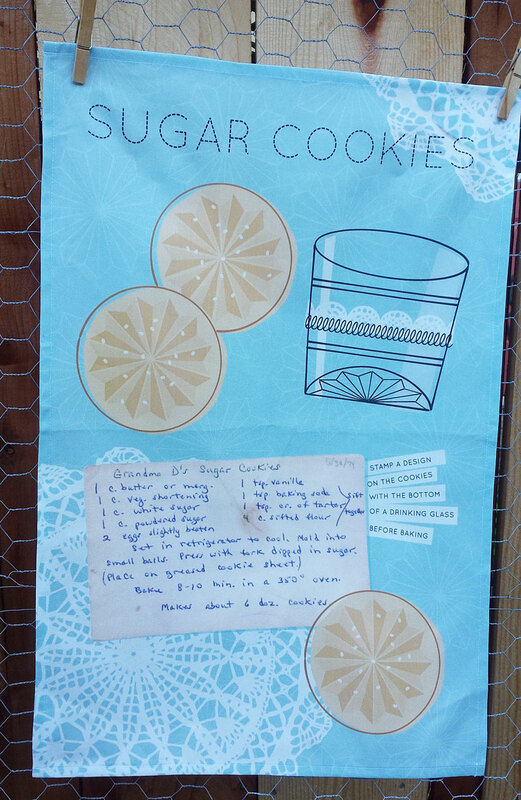 We settled on my grandmother’s sugar cookie recipe, for which she was mildly famous (at least within our extended family). She used to press the cookies flat with the cut-glass bottom of a drinking glass before baking them, leaving a pretty flower pattern on the cookies. When she passed away, each of her kids got one of the glasses so they could carry on the tradition. Pretty cool. Of course, my grandmother knew her recipes so well she never had to write anything down, so this recipe card is actually written in my mom’s handwriting, and carries the marks of many years of vanilla extract and buttery fingers. I decided to play against the vintage scanned recipe card with more modern accents, like a stylized drinking glass and cookies and simplified lace doilies in the background. 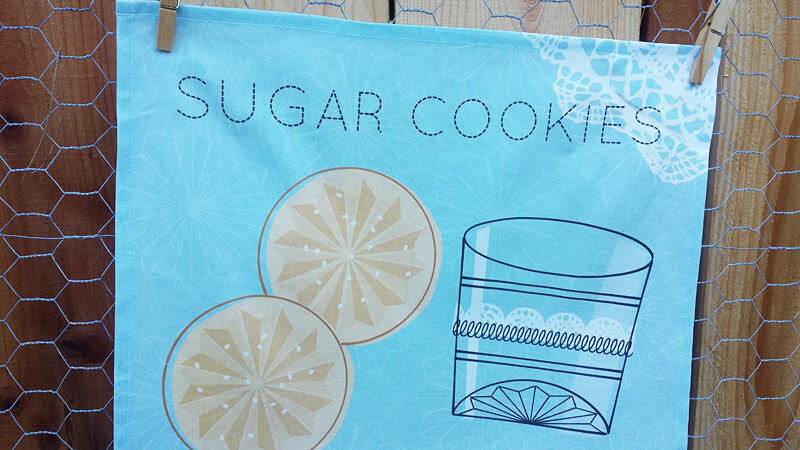 You can buy the Grandma’s Sugar Cookies fabric at Spoonflower, or have Roostery sew up a set of their Orpington Tea Towels (it prints the right way round, even though the preview may be sideways). Sift together baking soda, cream of tartar and flour. Set aside. Roll dough into small balls. Place on greased or silicone-mat-lined cookie sheet. Press dough balls flat with fork or bottom of glass, dipped in sugar. Bake 8-10 minutes or until firm and golden. Last week’s Spoonflower theme was Prohibition Cocktails – it turns out that America’s ban on alcohol in the 1920s gave rise to some clever mixed drinks, most of them designed to conceal the less-than-ideal flavor of bathtub gin. I studied up on Art Deco style, picked the honey-est yellows and dug out some vintage-looking fonts, then ran the whole thing through the excellent Mister Retro Permanent Press filter to give it a vintage printed look. 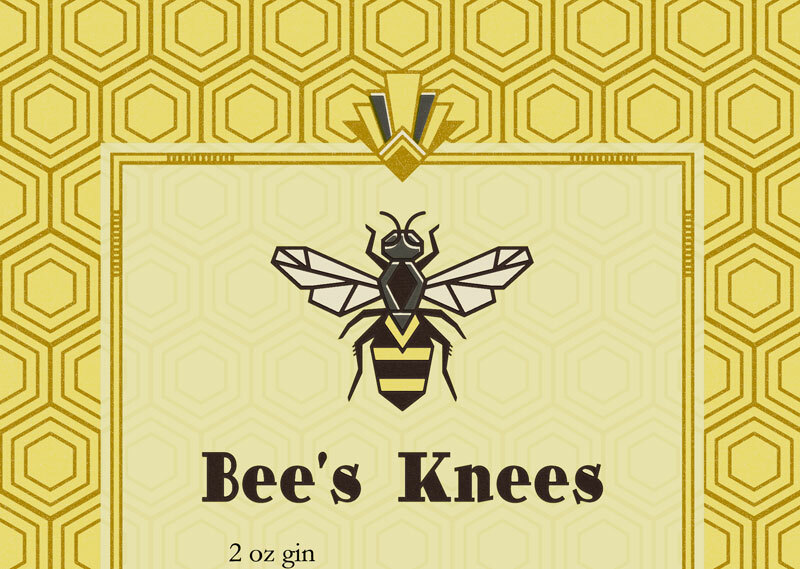 The end result was The Bee’s Knees Tea Towel, available now at Spoonflower and Roostery. My design just squeaked into the top 25 in Spoonflower’s contest, coming in at #24.